The seat frames and other steel scrap are offloaded, free of charge, to be recycled. 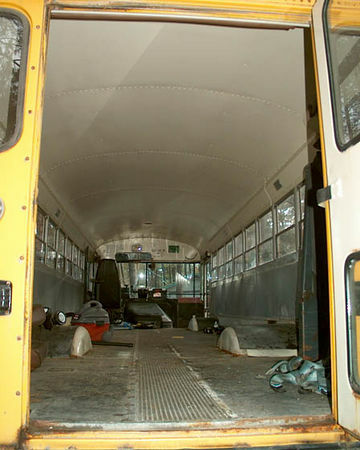 Now we have a lot more working room and the sight of the empty bus is uplifting indeed. The metal trim holding down the nasty rubber floor is also gone. Now, with floor-removal in sight, I have to deal with the walls. 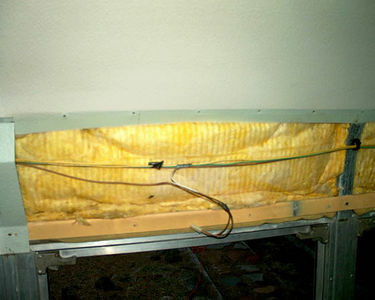 I have no idea if there is insulation in the walls & ceiling or simply an air gap. I was expecting an air gap, and have been researching insulation materials & methods, and also dreading the hundreds of rivets that are holding the interior panels to the studs. That's a lot of drilling, a lot of drill bits and a lot of time. I unscrewed the pseudo-conduit whch runs along the length of the bus at the wall/ceiling junction, thinking I could get a peek at the insulation situation. Ah, this is good. Very good. Probably saved me a few hundred bucks and a few weekends of work*. We'll have to work out how we'll deal with the windows and the curve of the ceiling. *With the benefit of hindsight...it turns out the fiberglass was not the boon I though it was. Keep reading! The wheelchair lift is visible just inside the bus, on the right. Your right.